Control your replica by your phone. We announce the new begining for AEG's, the new for your hobby. Warning! All order placed before 9th May 2017 are clasified as pre-order. Paid purchases will be executed after 9th May 2017. Simple! You are starting the battle using bluFET Mobile App, then play your game. After that your mobile phone automatically sends positions, movement and statistics to our server. 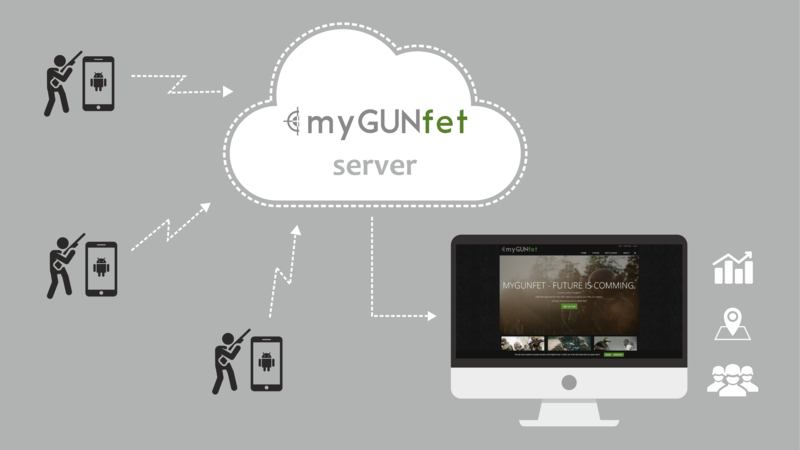 Now you can visit myGUNfet.com and follow your battle! Switching between 3 preconfigured modes by tilting airgun clockwise or counterclockwise. this function allows the high current powering the motor not to flow directly trough the trigger contacts. It will help you achieve faster trigger response, higher ROF, and - what is most important - longer life of your replica. Do you release the trigger? BluFET will stop the engine, and you will not be able to shoot any more bullets? In your application you can set the amount of bullets which are to be fired after pressing the trigger, and bluFET will do it for you! Automatic mode of fire. Do you need less ROF? Decrease the power of engine. BluFET regularly informs you about the ROF of your rifle. System which releases the spring in order to leave it stretched and as a result protects the spring. Constant measurement of the temperature of MOSFETs – in case of overheating, bluFET will not be damaged. System which detects short circuit in order to protect the engine, battery and transistors against damage. Dynamic protection of the battery against damage. System will not allow excessive battery discharge which can result in irreparable damage. bluFET comes with special coating which offers protection against moisture. You can use it in harsh wheather conditions. By combining measurement of motor current and 3D acceleration, you achieve very precise shot detector. Mobile application which configures the operating modes of your rifle in Android system. Mobile application which configures the operating modes of your rifle in IOS system. Gunfet mobile application will run a lot of your rifles. Open the application and select your gun to join the battle! The mobile application will be available in Polish, English and German language. Your mobile phone will let you know in case of any alert (overheat, overcurrent, battery warning). Your mobile app records your position, movement and transfers data to our server. Visit myGUNfet.com, create teams, battles and send reports. You can compete and compare statistics with other players too! After the battle you can reconstruct movements of all players (you and your friends). Your battles provides statistics you can analyze, share and improve. On myGUNfet.com you can find such statistics like: shots, distance, frags, deaths and many more!